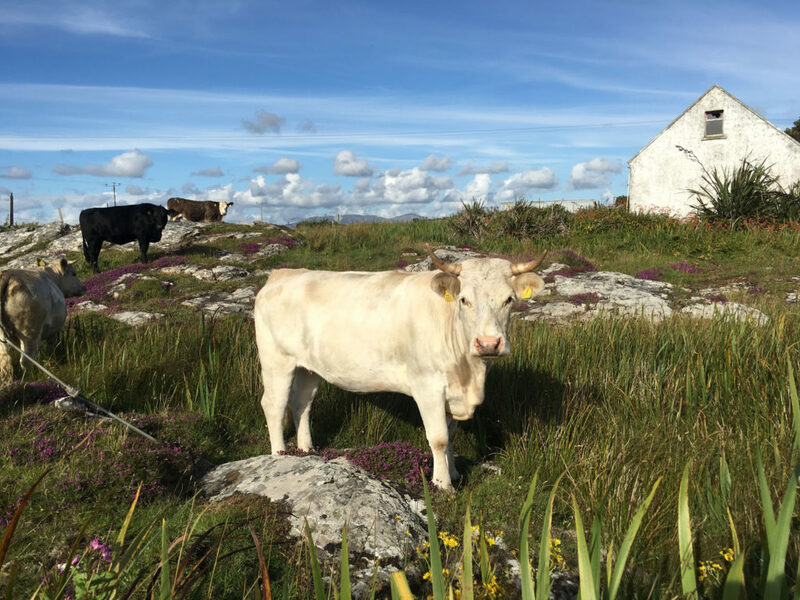 Connemara with its majestic mountains, dramatic rocky shores, gorgeous lakes, bogs and fields dotted with grazing sheep is quintessential Ireland. 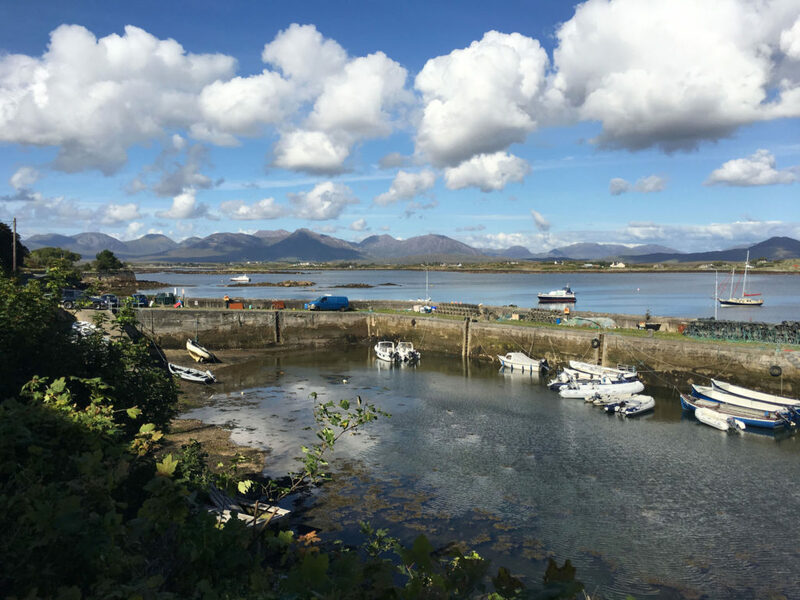 Tour the Wild Atlantic Way, arguably the most beautiful aspect of Ireland, the west coast from Galway Bay to Killary fjord, and Westport. 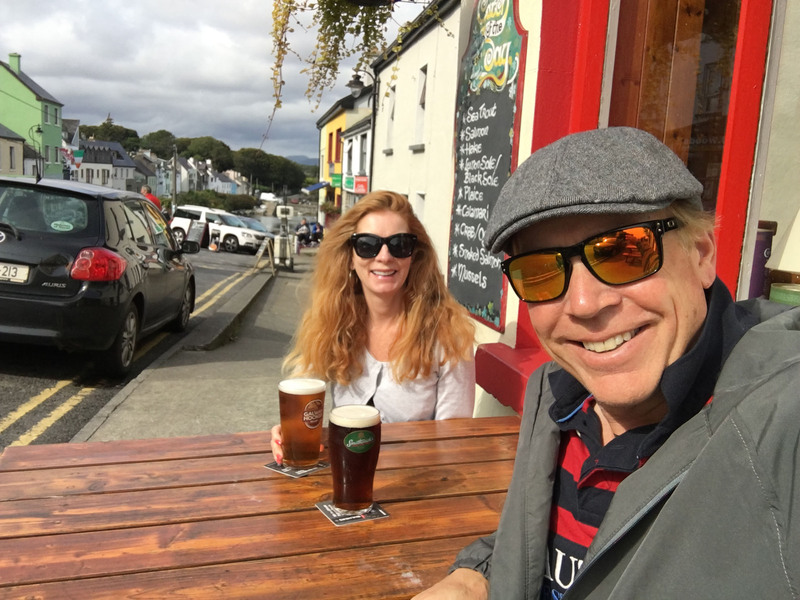 The Irish love Connemara for “holiday” if that’s any clue. 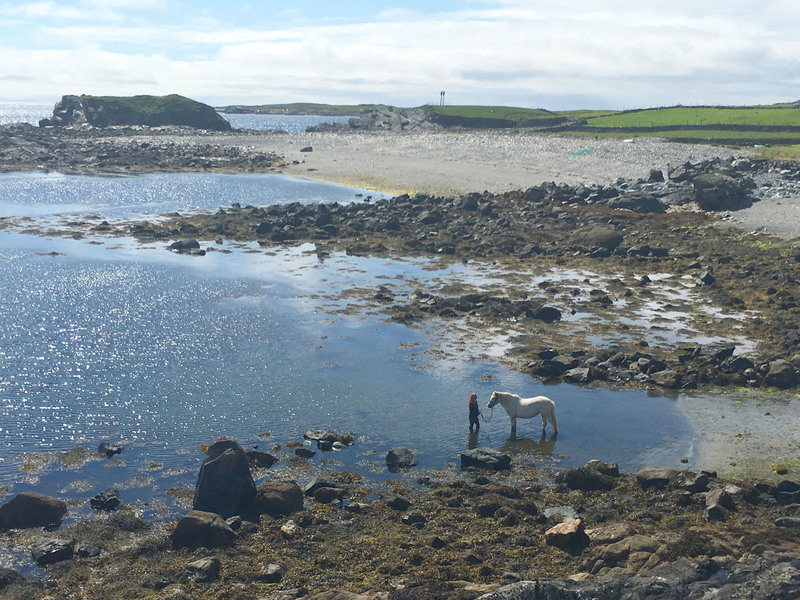 Connemara means “inlets of the sea”, and this coast is stunning, rugged and wild with stones amid flowers, sheep everywhere, Connemara ponies, and the occasional sand beaches and big mountains. 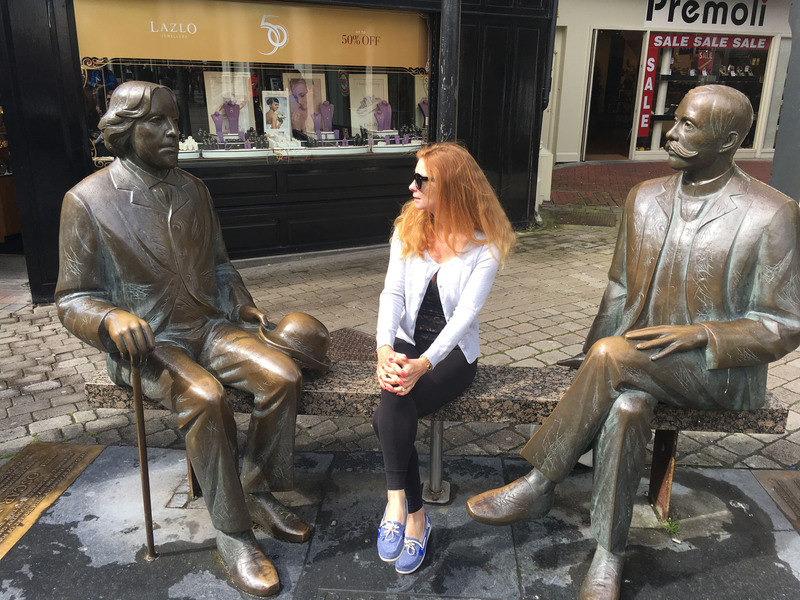 Oscar Wilde called Connemara “savage beauty.” Galway Bay is huge and gorgeous, with the legendary Cliffs of Moher plummeting to the sea, and views to sea and the outer islands. 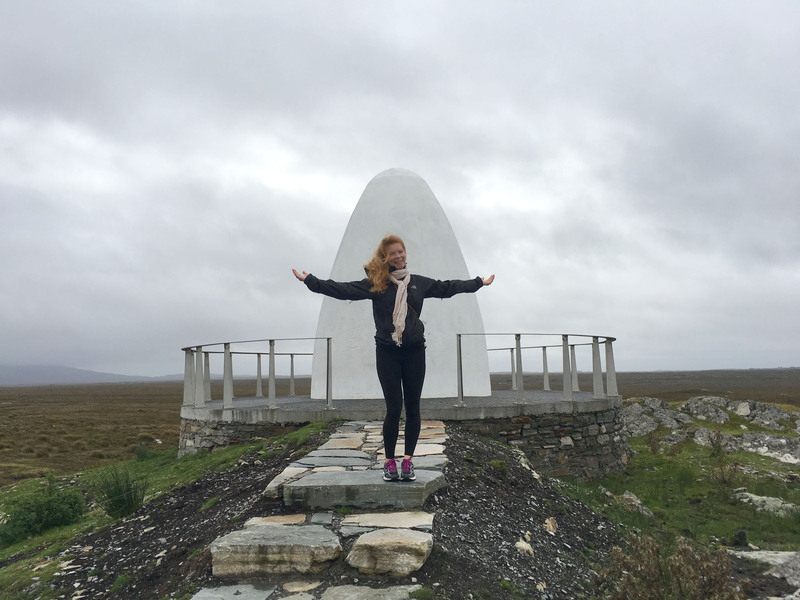 Clew Bay is amazing, with ferries out to the Aran Islands, and Inishbofin Island. Discover Galway on a Saturday, or Sunday, when the cobblestone streets fill with entertainers, music and the vibrant farmers market by St Nicholaus Church. 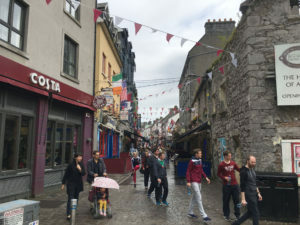 This pub and party city is a delight, just strolling the Latin Quarter and Quay Street is a pleasure, follow the music and laughter pouring out of the pubs. 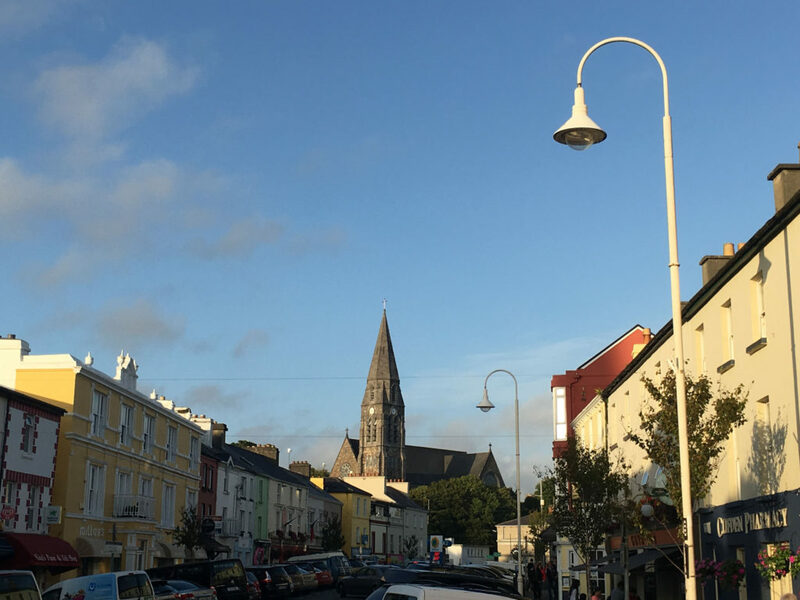 Peruse the fresh cheese, local produce and crafts at the open market in the morning. This medieval city of 70,000, called the City of Tribes with its Spanish Arches, is a feast for the eyes, ears and palate. 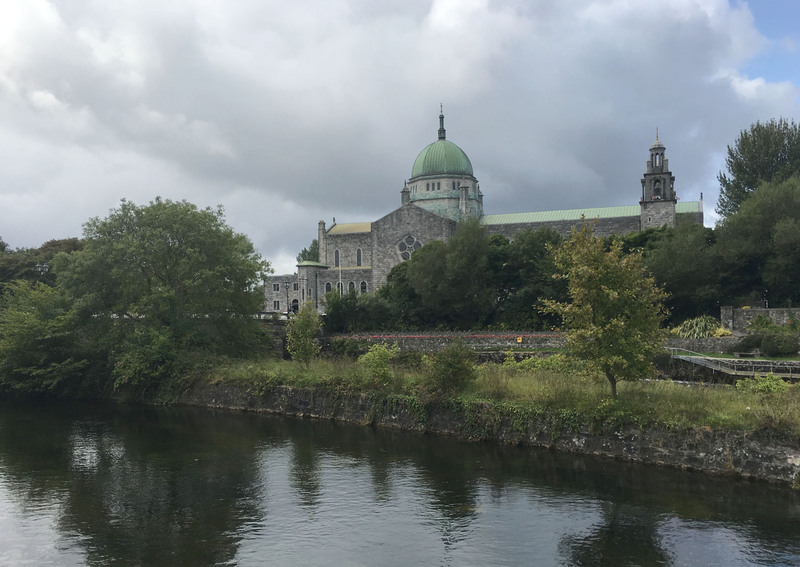 Go to Sheridans Cheese shop and wine bar, Kings Head Bar, Eire Park through the Brown Door, and the spectacular 1965 Galway Cathedral across the river. 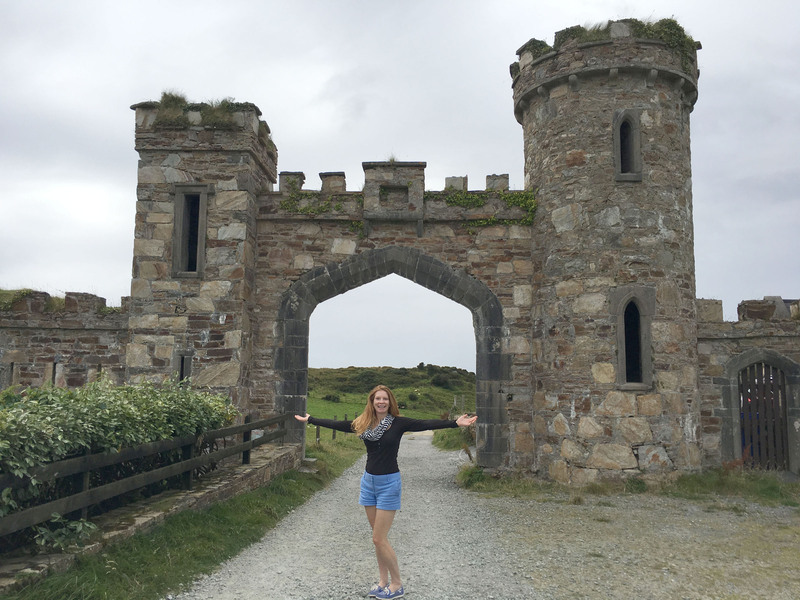 Drive the Sky Road – a beautiful hilly 20-km drive along Clifden Bay, past the Abbeyglen Castle (where you might stop for tea or a pint) and the remains of 1818 Clifden Castle (walk down the dirt path to see this medieval stone manor). 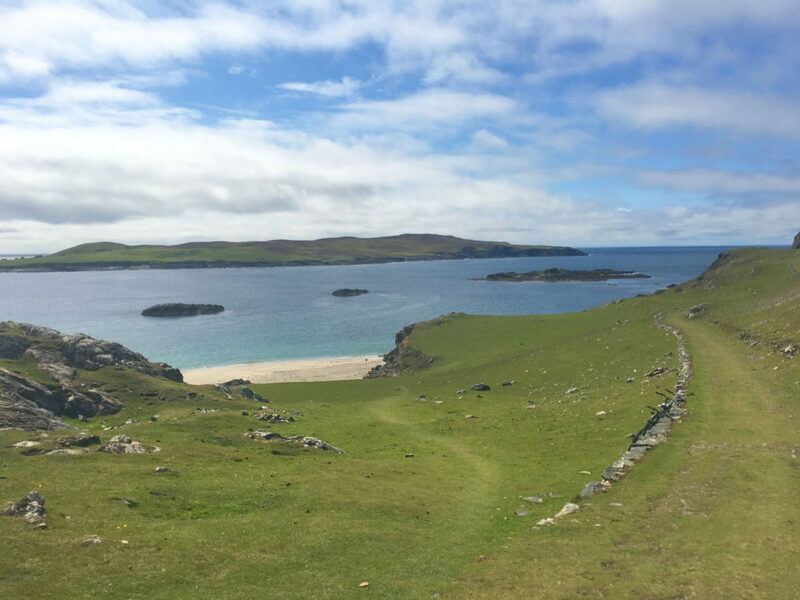 As you continue outward, you will have magnificent views of outlying islands, Inishturk and Turbot Islands, coastal pastures filled with sheep and white cows, along narrow ups and downs lined with a labyrinth of stone walls. 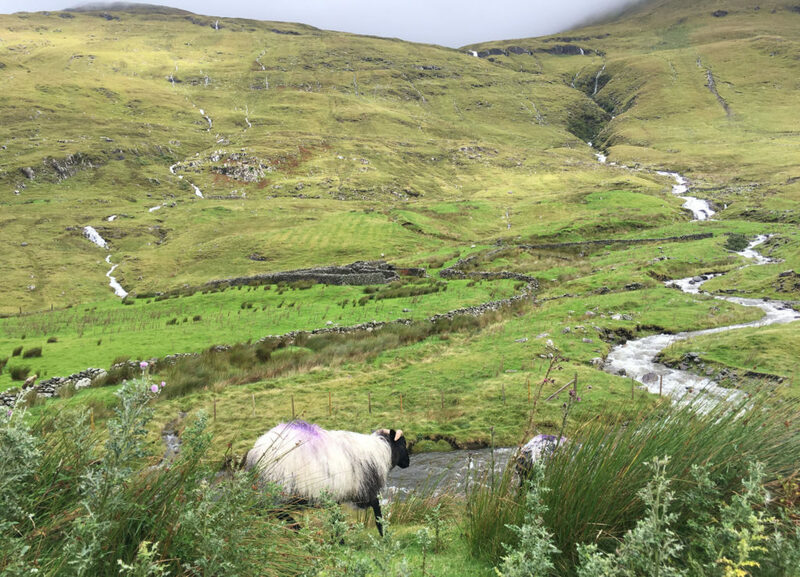 We’d say biking is risky on these narrow roads with oncoming cars, tractors and sheep-traffic, ride at your own risk, in bright clothing. There are several other scenic loops in Connemara, Claddaughduff to Cleggan, Tully, Ballyconneely to Roundstone – all dramatic drives. 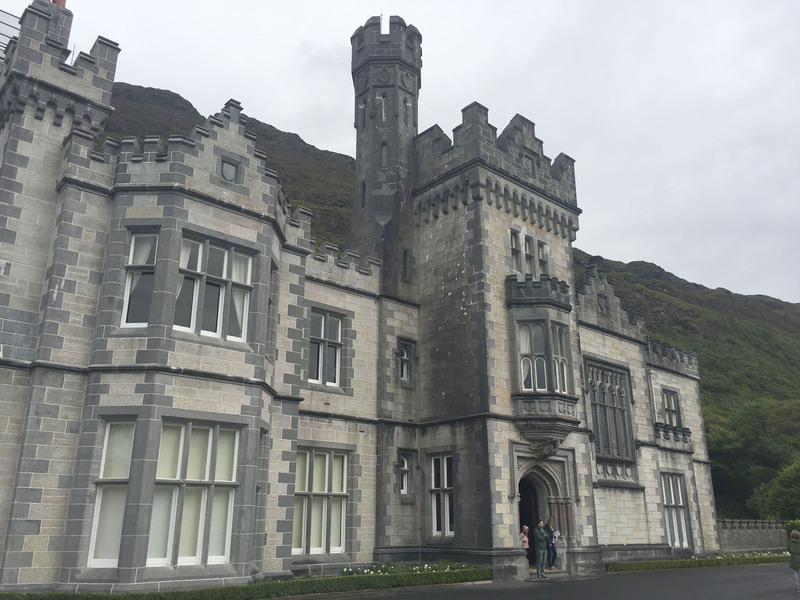 Visit Kylemore Abbey, this 1867 castle has a fairytale story. 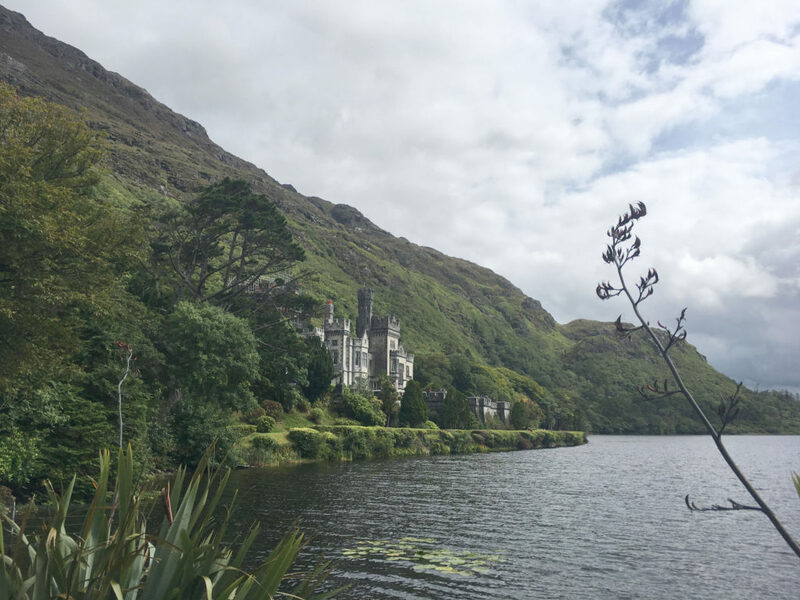 Kylemore is a grand estate built as a romantic wedding gift, with a tragic outcome, that later brought the nuns and a successful abbey to the 1,000-acre estate in the 1920s. 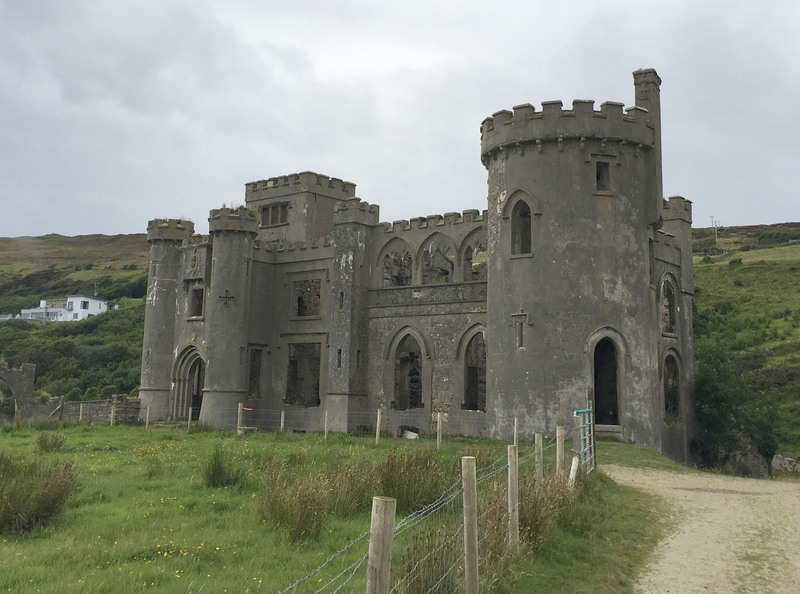 Tour the iconic Irish castle, the mausoleum, the miniature neo-gothic chapel with bats in the belfry, and the 6-acre Victorian walled gardens – the largest in Ireland. Kylemore means Big Wood, over 30,000 trees were planted here. 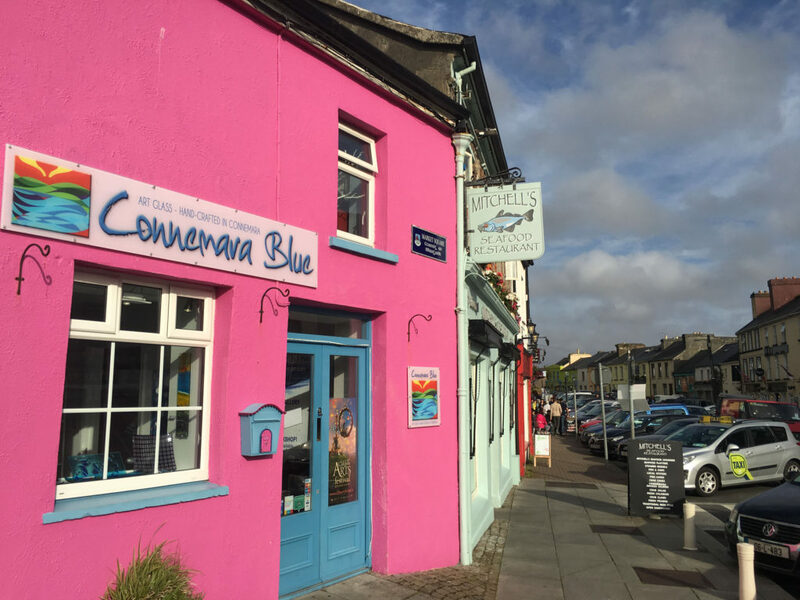 Clifden is a charming 1812 village, the capital of Connemara, loaded with boutiques and authentic pubs for food and Craic – live music – in the evenings. Best food is at Darcy 12. 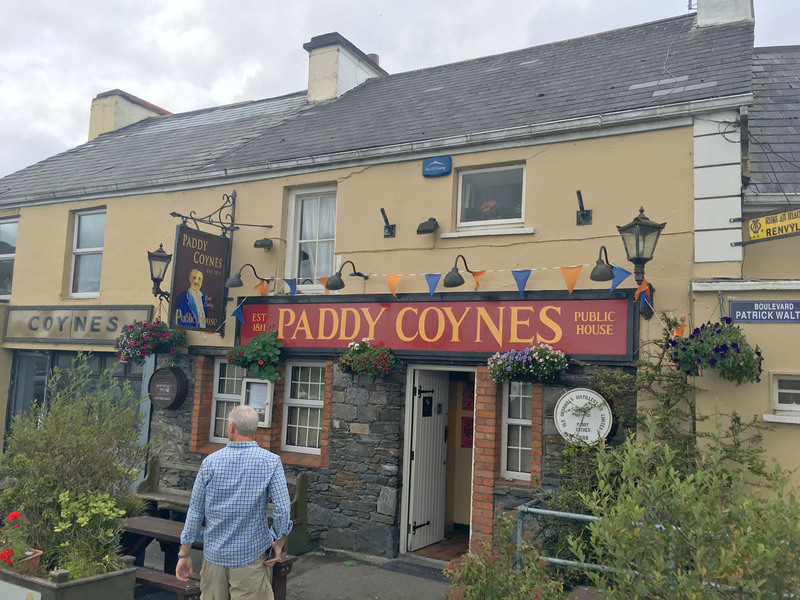 Our favorites for cozy pub atmosphere and lively Irish music are Lowry’s, Mannions, EJ Kings and MacDara’s all on Market Street. Griffin’s is authentic as well. 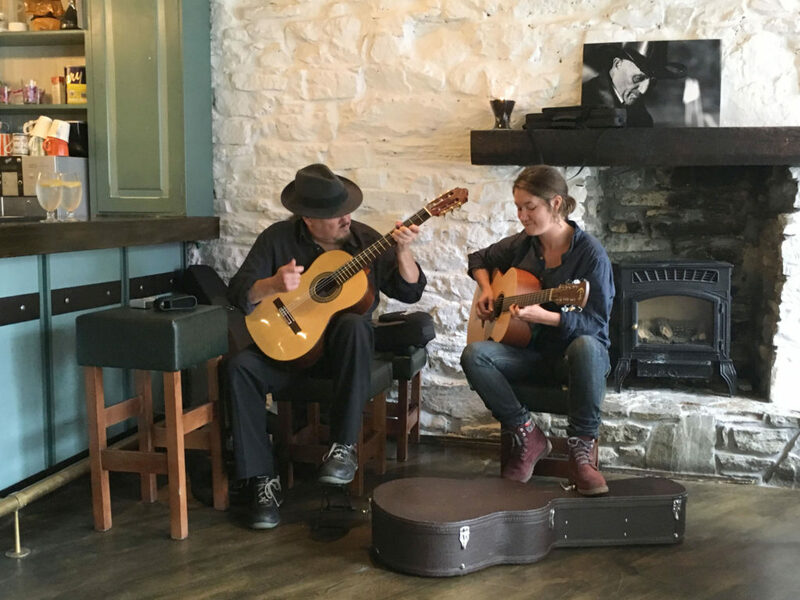 Mullarkeys at Foyles Hotel on Main brings big bands. O’Malley’s serves a heaping bowl of mussels, but go during the music, which ends at 8:30ish, they pull the curtains closed and pack up promptly at 9. 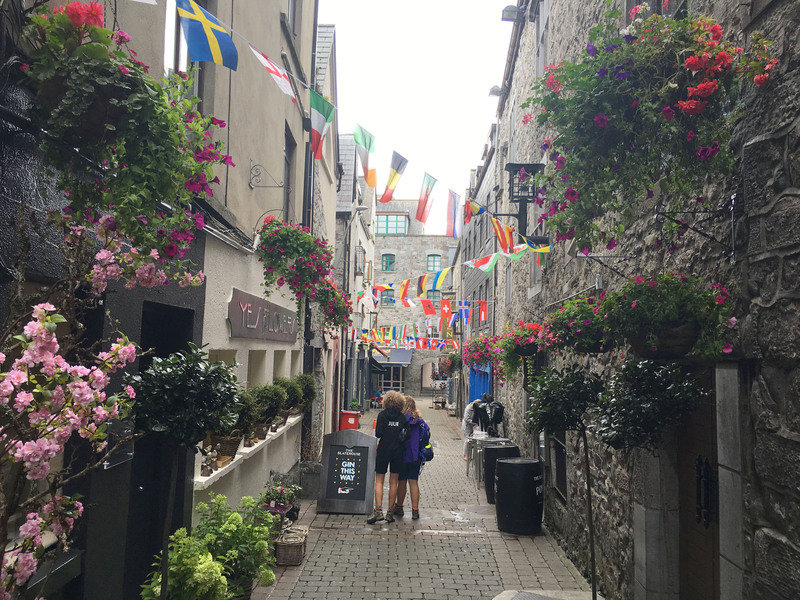 If you long for a Claddagh ring, go to O’Dalaigh’s family jewelry, Jonathan will charm you with silver and gold of this revered Irish symbol. 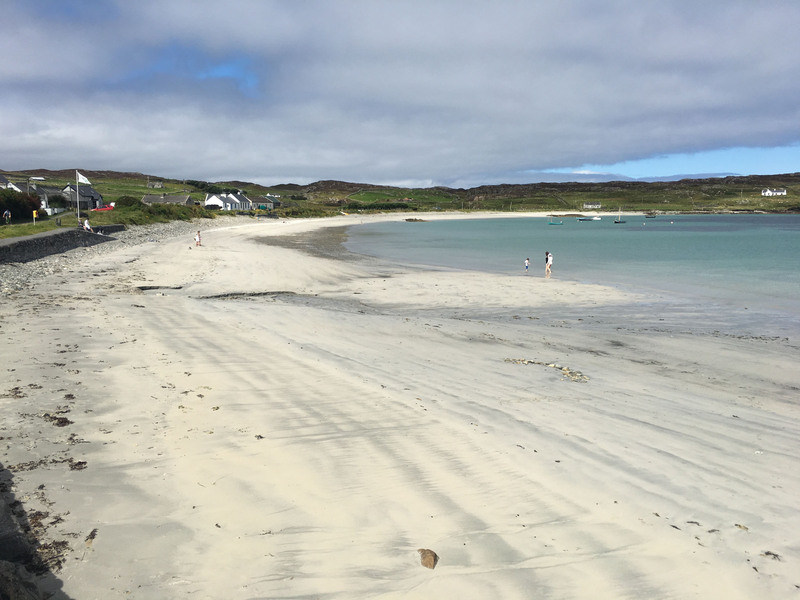 Connemara beaches if you happen upon a sunny summer day in Ireland, consider yourself lucky, and go to one of the pretty sand beaches tucked between the otherwise rocky coast. 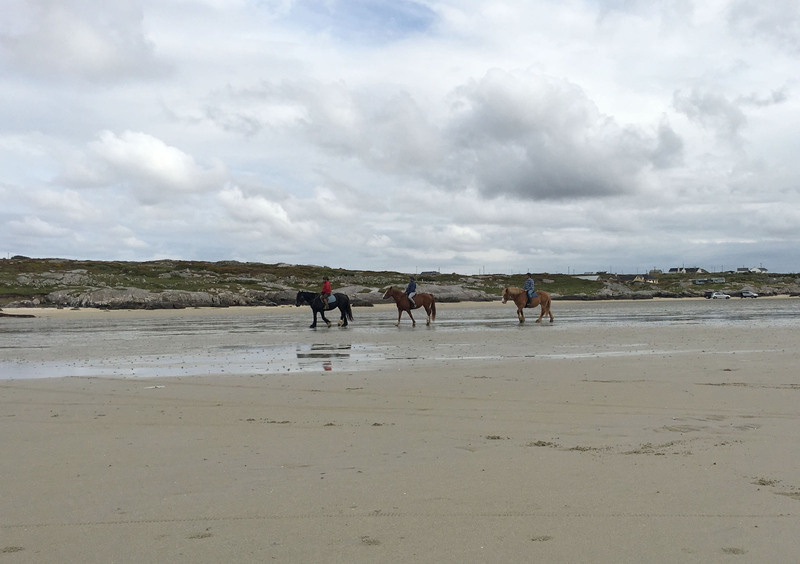 Ballyconneely’s Coral Strand is one pleasant beach, Dog’s Bay and Gurteen beaches in Roundstone are Caribbean-colored in Connemara. 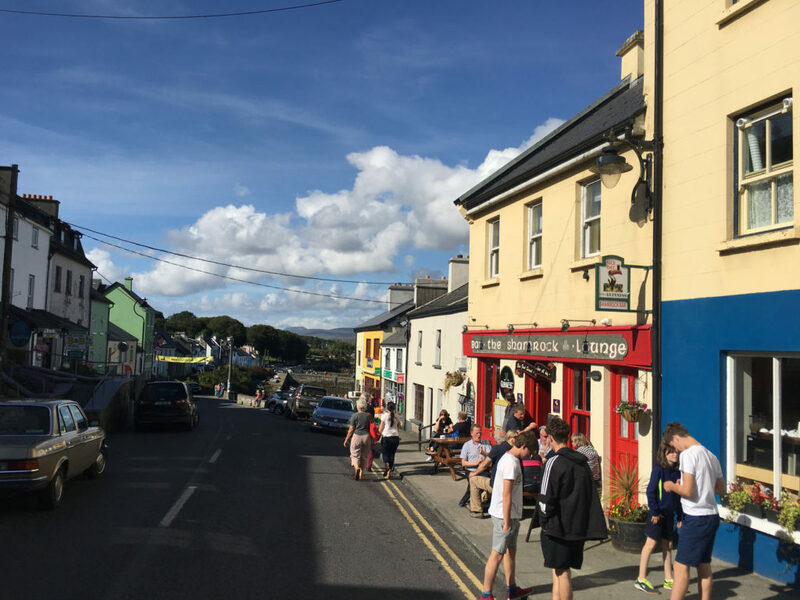 Roundstone is a pretty Irish seaside village, location of many a film given its brightly painted pubs and coastal views. 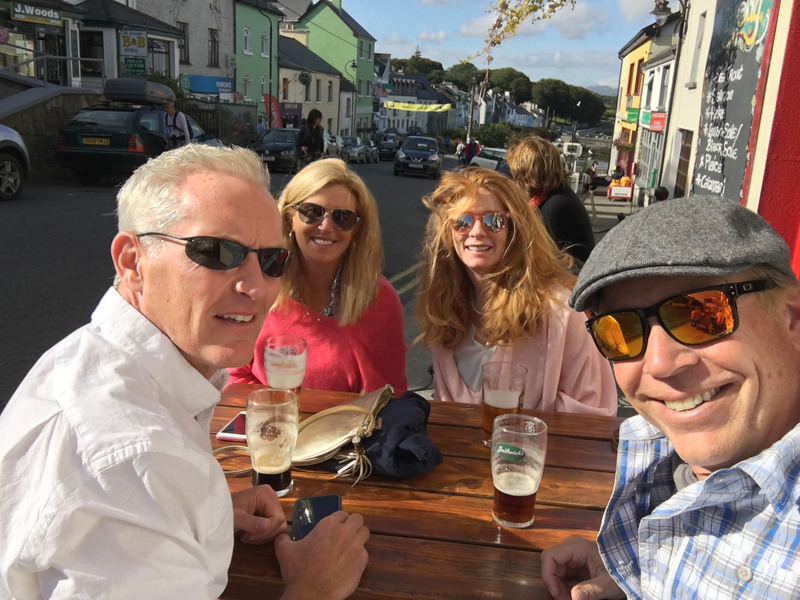 Have a pint and a pile of mussels, salmon or seafood chowder at Shamrock Pub, or O’Dowds where the locals get their craic on, and visit Roundstone craft shops in the old Franciscan Monastery. 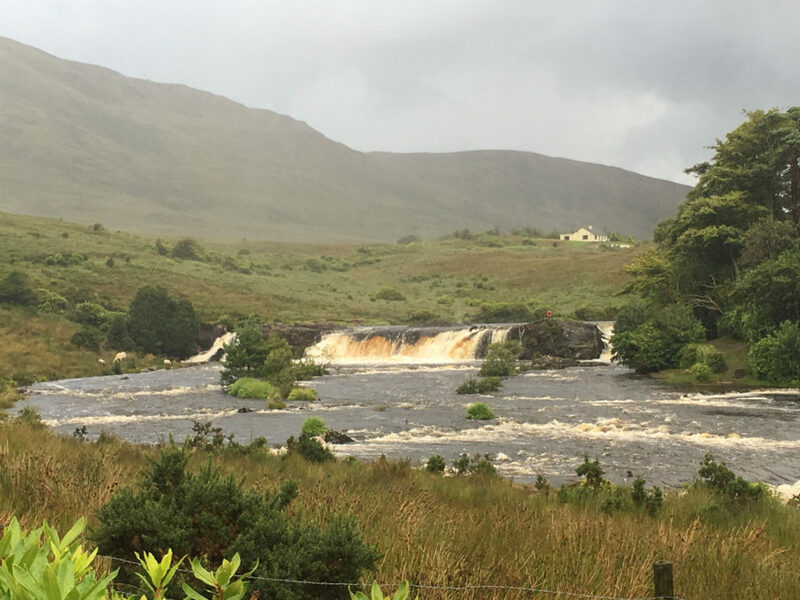 Connemara National Park admission is free in Letterfrack, this beautiful 2,000-acre park (one of six parks in Ireland) offers an interpretive info center, extensive walking and hiking trails, with spectacular views of the Twelve Bens, all of which are over 1500 feet. 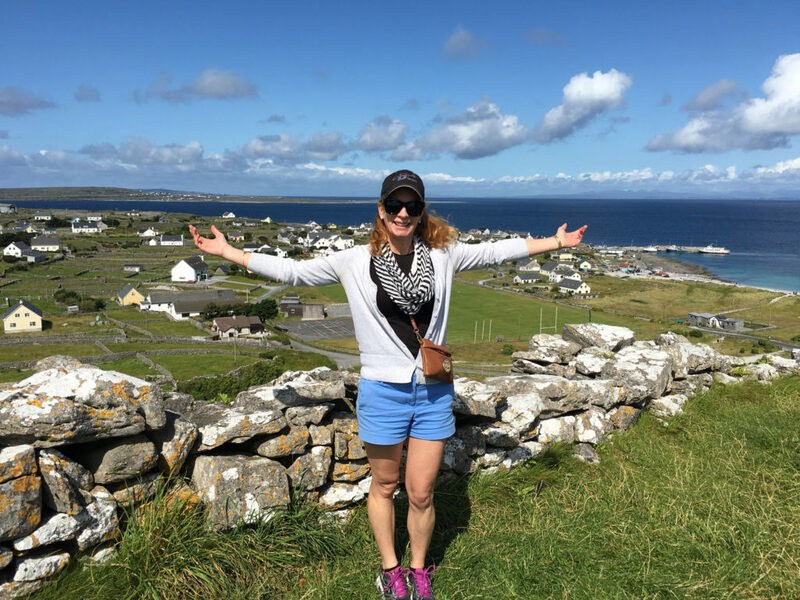 Climb Diamond Hill for a more moderate 2.5 hour hike with above tree-line breathtaking views. 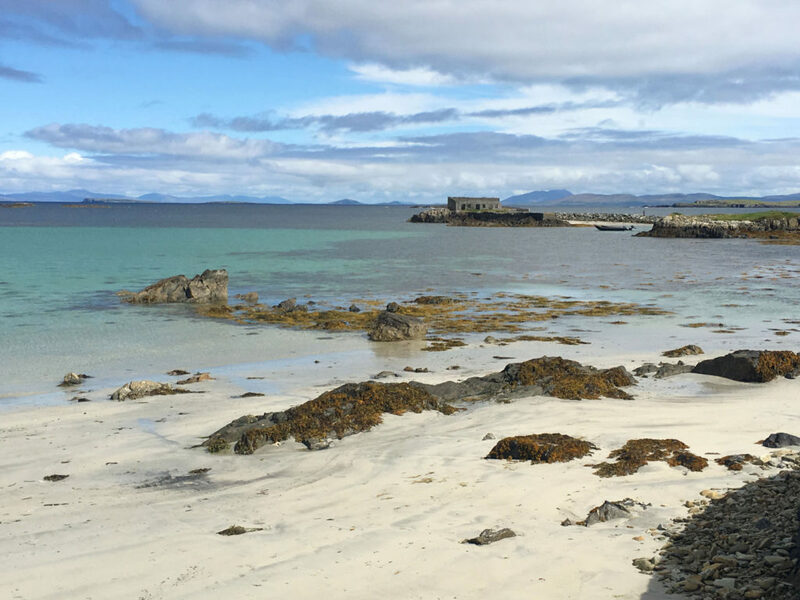 Go to the Islands – the outlying western Aran Islands, Clare and Inisbofin are spectacular, with surprisingly better weather than mainland Ireland. Best explored on bikes, tour narrow winding roads, stunningly scenic hillsides with views back to mainland Ireland, cliffs plunging to the sea, and plentiful sheep and stone walled fields. 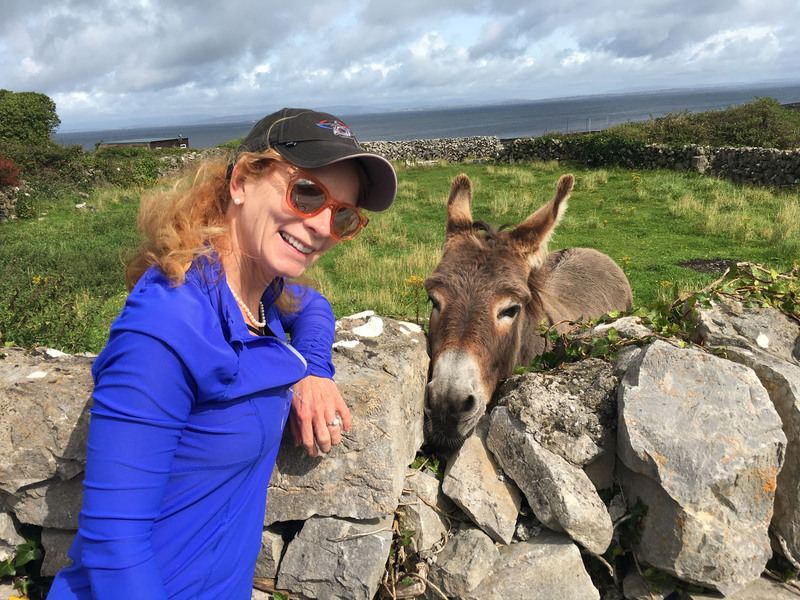 Island life is fascinating, historic, portraying life from centuries past, and islanders are incredibly welcoming yet relaxed. We suggest you take the morning ferry out, reserve in a local BnB to stay the night to truly enjoy island life, local craic in the evening and explore at leisure the sights outside of peak ferry visitor times. 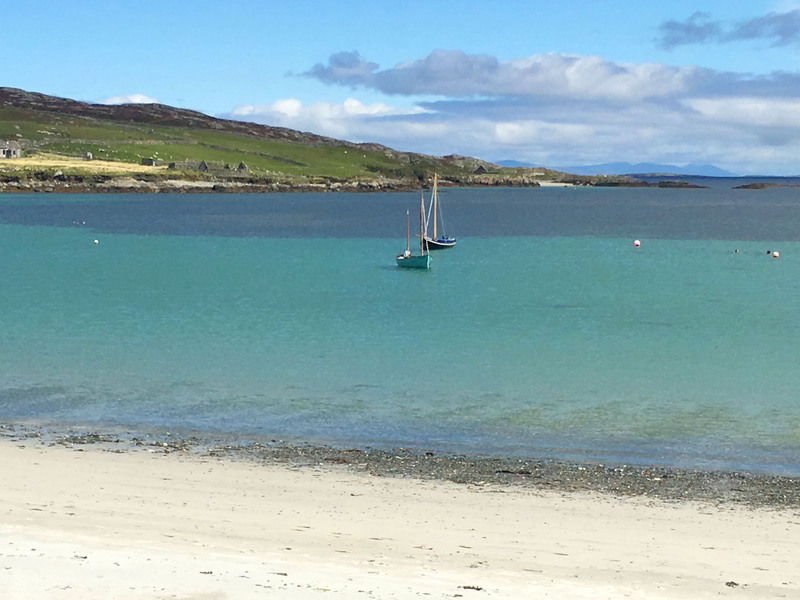 See our review of a few of the beautiful west coast islands. 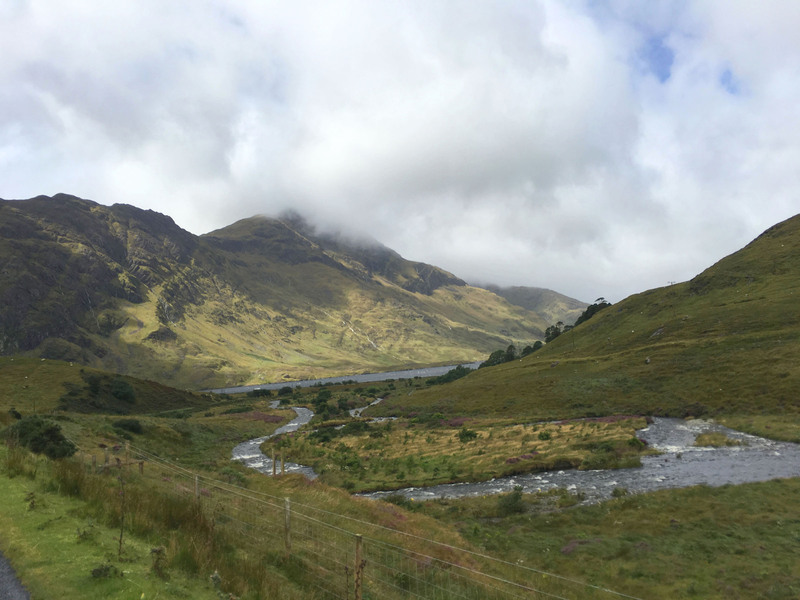 Killary fjord is a beautiful drive, a must see scenic route to Ashleigh Waterfall on Erriff River, on your way to the Roonagh ferry to Clare island or to Westport. Killary is Ireland’s only fjord, 16-kilometers long and 45 meters deep in places. Continue to Wesport, a delightful colorful shop filled, pub rich town, with two grand churches too. After touring, go to Matt O’Malley’s Pub for a pint– home of the original Chieftans. 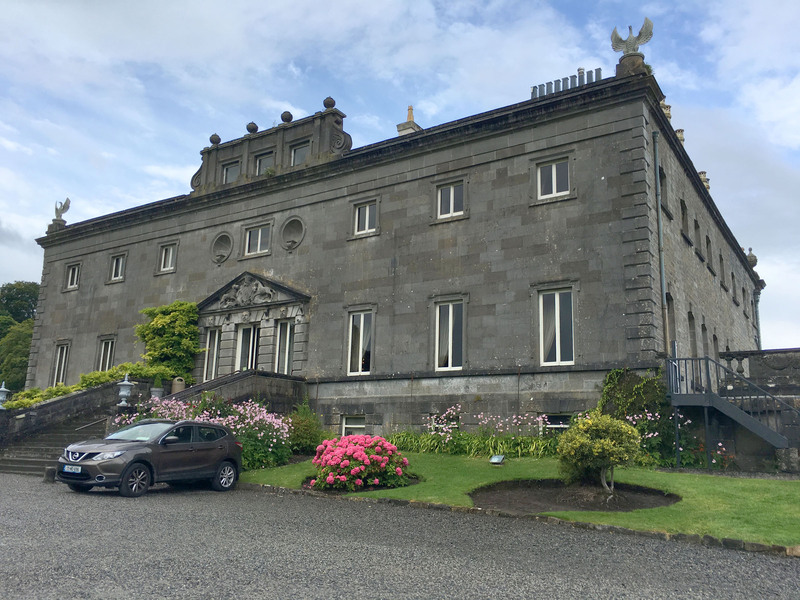 Westport House is a grand mansion from 1730, worth the tour, even if it’s a little carnivalesque – the Browne family had to pay for their grand estate somehow so they’ve made it amusement park-ish. Don’t miss the dungeon that dates back to Grace O’Malley’s original castle here in the 1500’s. 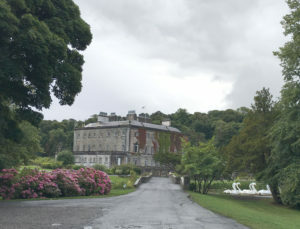 This family house with 30 rooms and 45 fireplaces is beautifully kept, overlooking a gracious pond with swans. 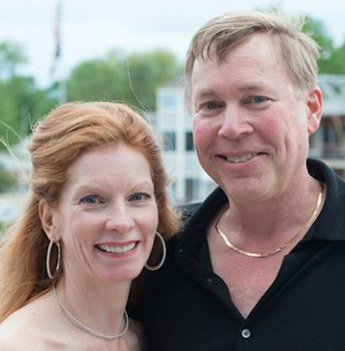 Walk the grounds, and if traveling with kids, you’ll be lured to the carnival rides, carousel and Pirate Park. 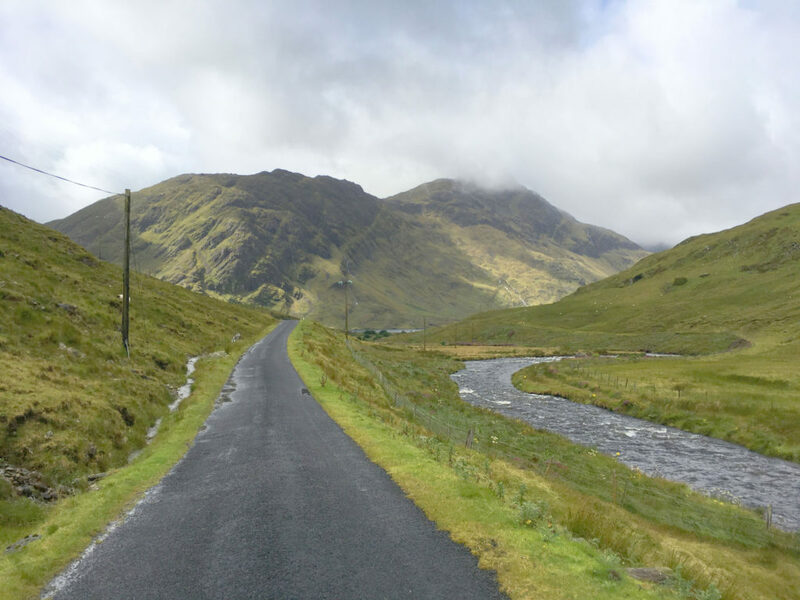 Sheeffry Pass is a stunning narrow road from Westport through incredibly “ghostly” mountains, including the towering Croagh Patrick (where St Patrick sat for 40-days) – a conical peak of quartz, with waterfalls, bogs and fields below. 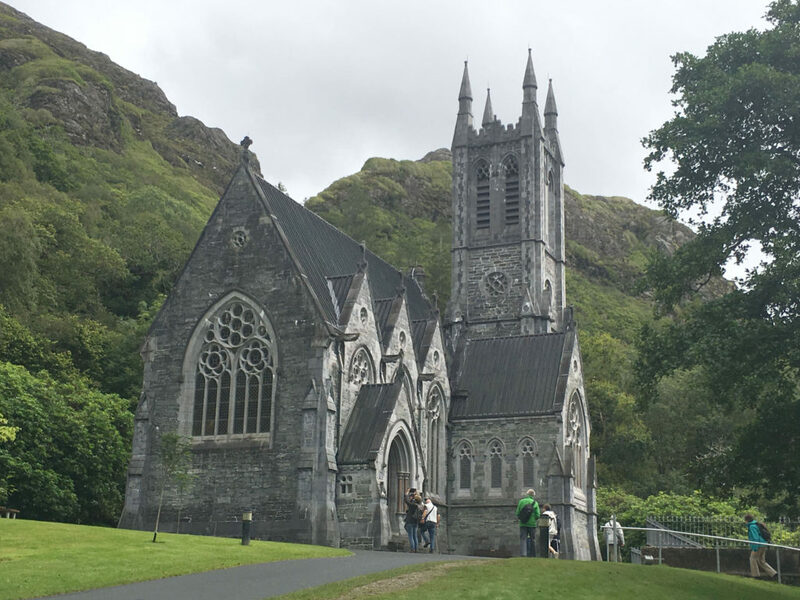 This region was stricken especially hard by the potato famine. Sheeffry is a great bike passage, toward Delphi. 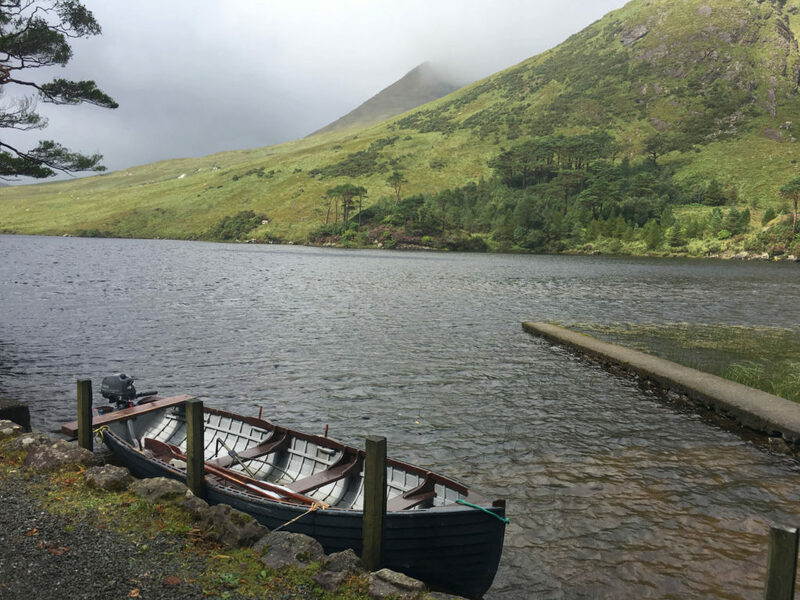 Be sure to visit Delphi Lodge – a gorgeous lakeside 4-star resort, with an authentic 1830 house, and a more modern resort lodge and spa with beautiful mountain views from the upstairs bar, the food here is excellent – a step above the standard Irish pub fare. 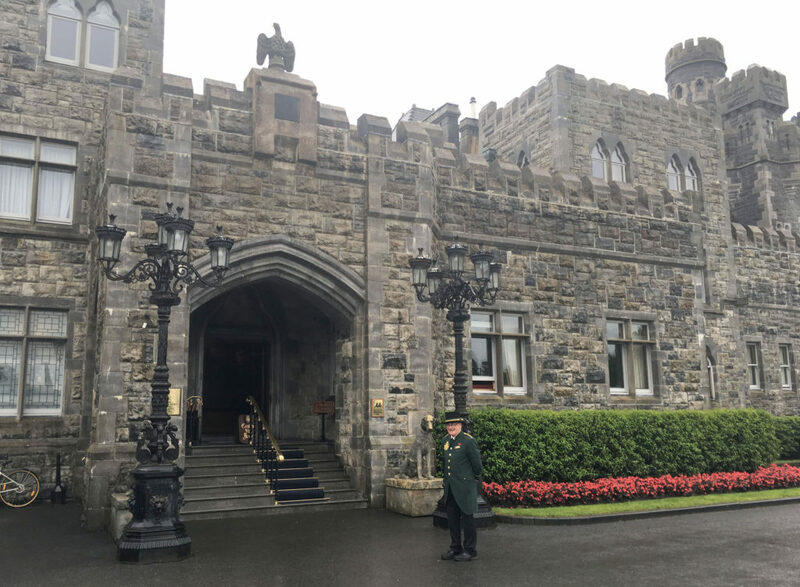 Have high tea at Ballnyahinch Castle, this fairytale castle is now a luxury four-star hotel, stay the night on the 450-acre estate or at least for a drink by the fire in this magical 1750 manor over a reflecting pool. This lovely Irish castle, a hotel since 1946, is surprisingly unpretentious despite its grandeur, as is much of Ireland. 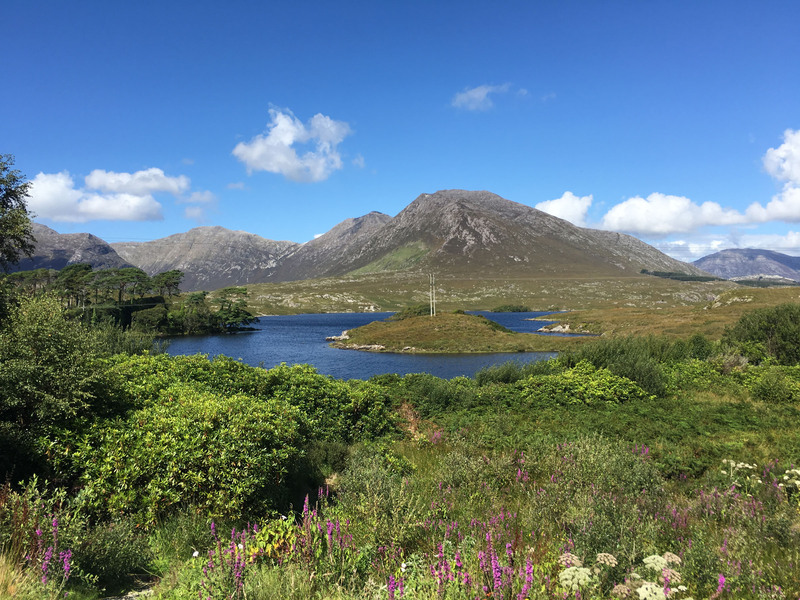 Walk the 6 kilometer of paths along the Lake and Owenmore River, with grand views of the 12 Bens, or pins as they’re called, these mountains are majestic – Ben Lettery is best viewed from here. 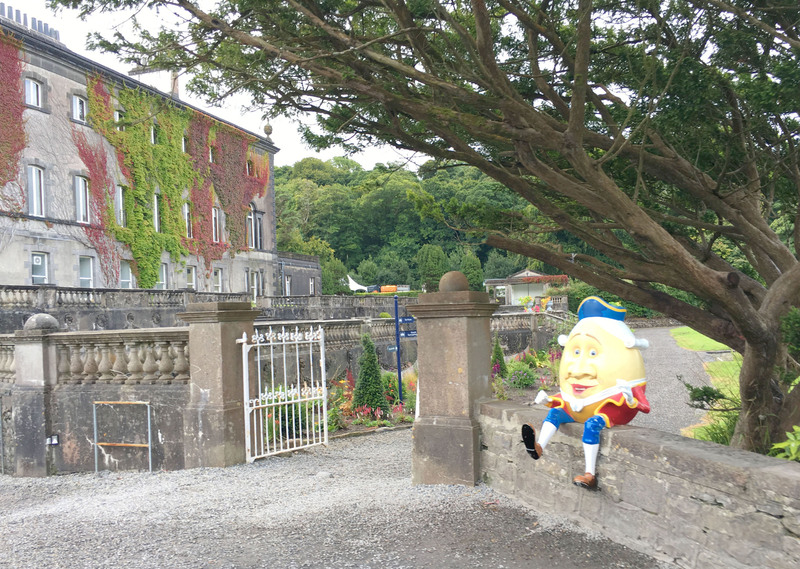 Go to Cong – Cong is a super quaint Irish town, where John Wayne’s Quiet Man was filmed, with a centuries’ old abbey, and the exquisite Ashford Castle…now a five star luxury hotel. 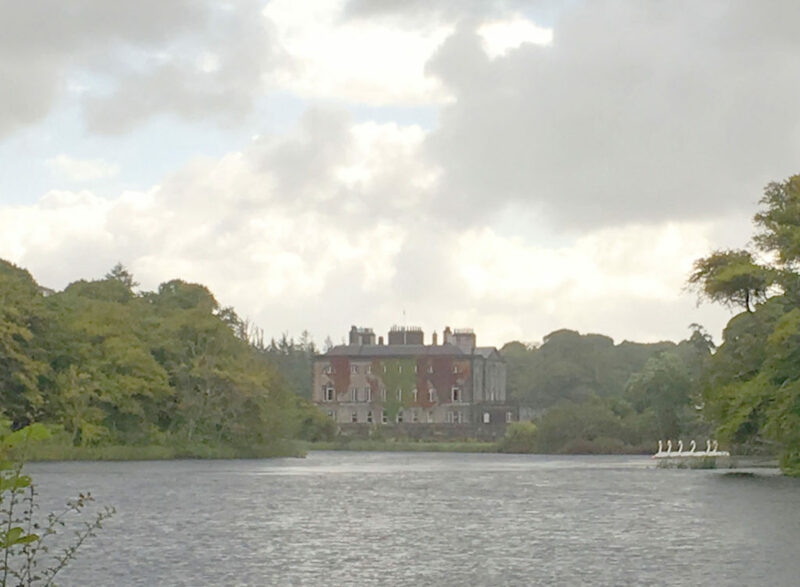 This 13th century Ashford palace is grand, with expansive 26,000 acre gardens and beautiful grounds on the shores of Lake Corrib, and lavish interior. 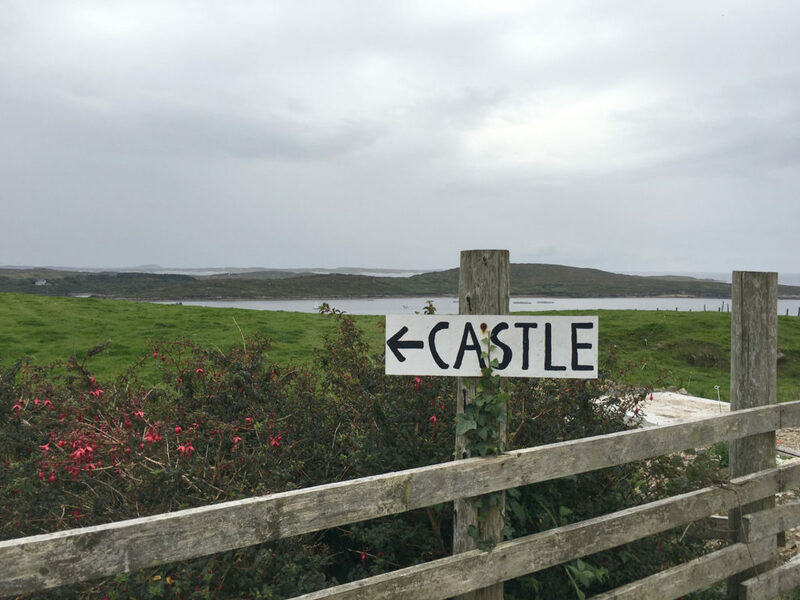 BUT, you must book in advance for a seating at tea, or fancy lunch to gain access to the gorgeous castle, which is exclusive to guests. 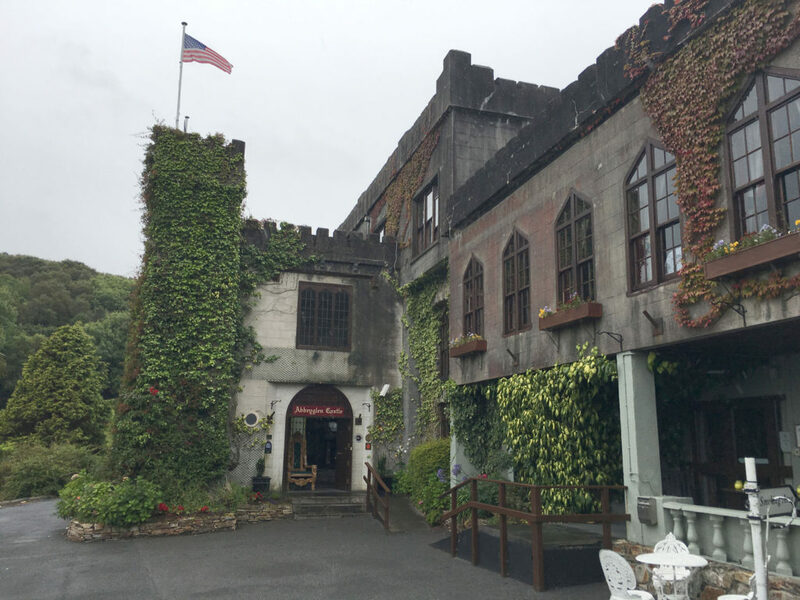 The jaunty well-dressed bellmen will stop you at the Castle entry. 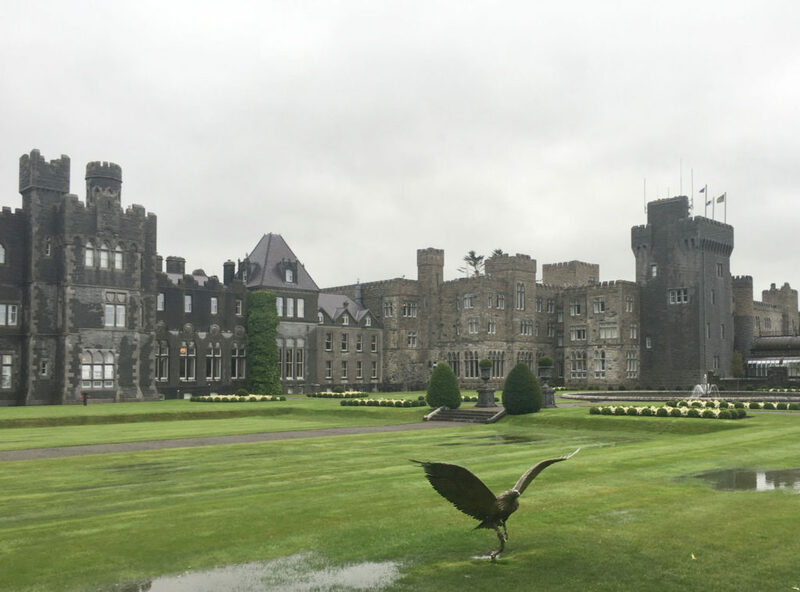 Splurge on a reservation and enjoy the luxury lifestyle staying the night in this grand chateau of over 80 luxury suites, or make a dining rez. 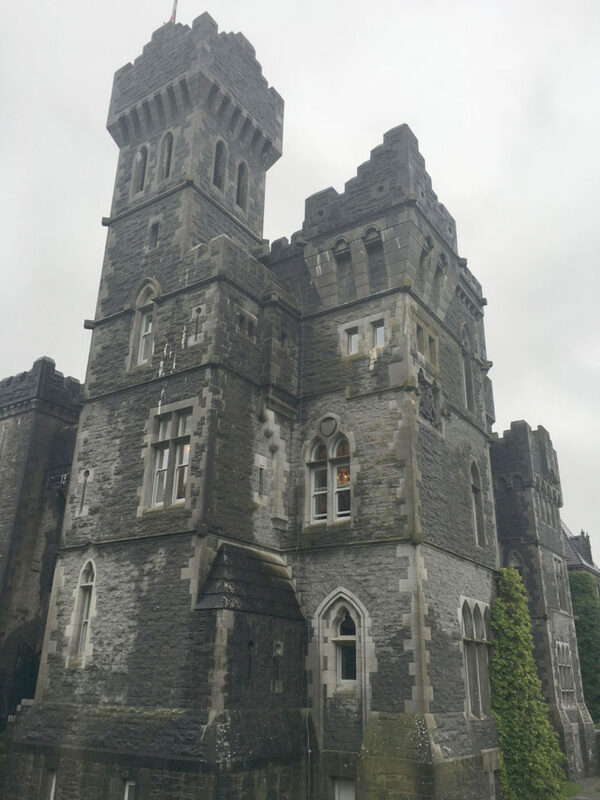 The Guinness family owned this castle (1852-1939) as their personal playground until it became a hotel…Ashford is beyond impressive. 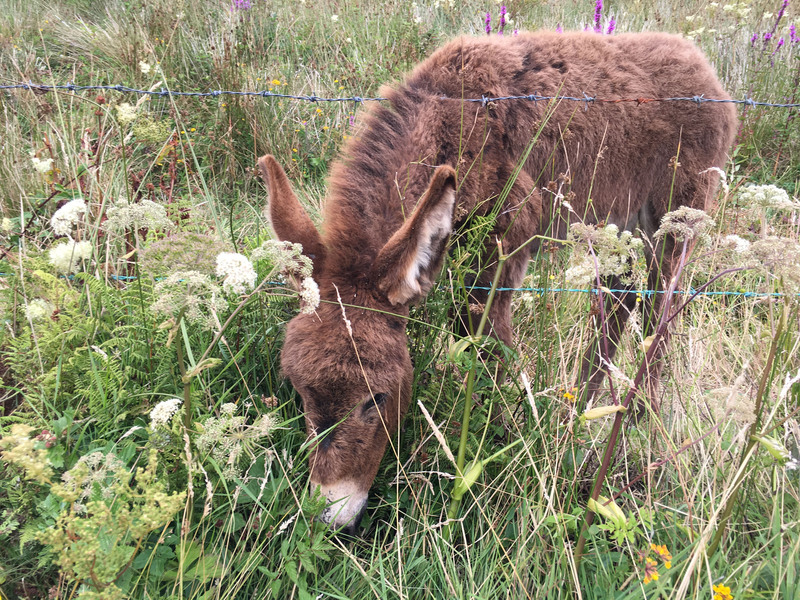 Joyce’s Pass is a beautiful departure drive, over rambling roads past lakes, rivers and pastures filled with fluffy sheep and brilliant flowers. 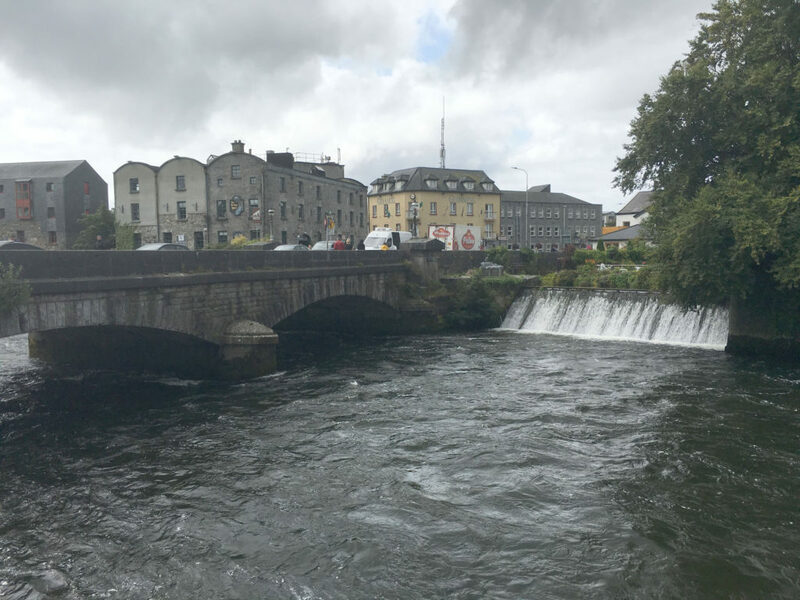 The weather In Ireland, even midsummer, is often cool and “moist” which indicates rain. 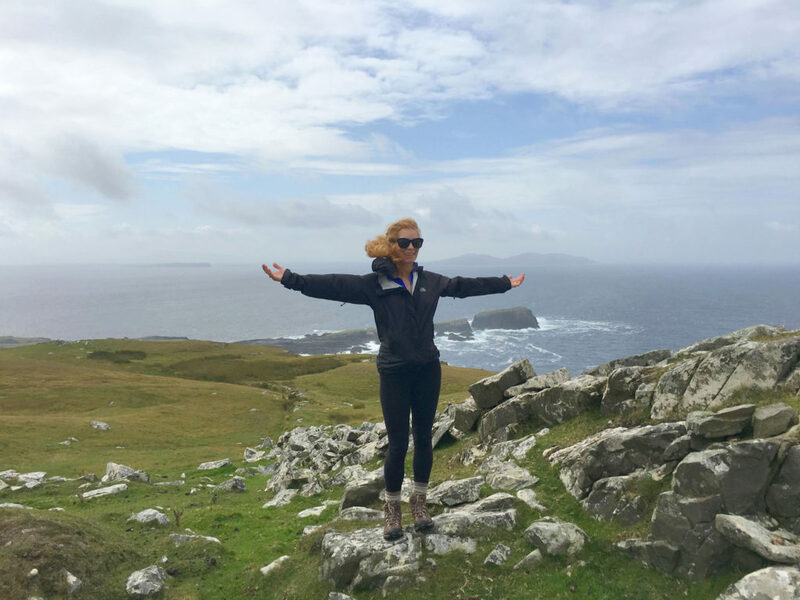 You need a sweater and a rain jacket. 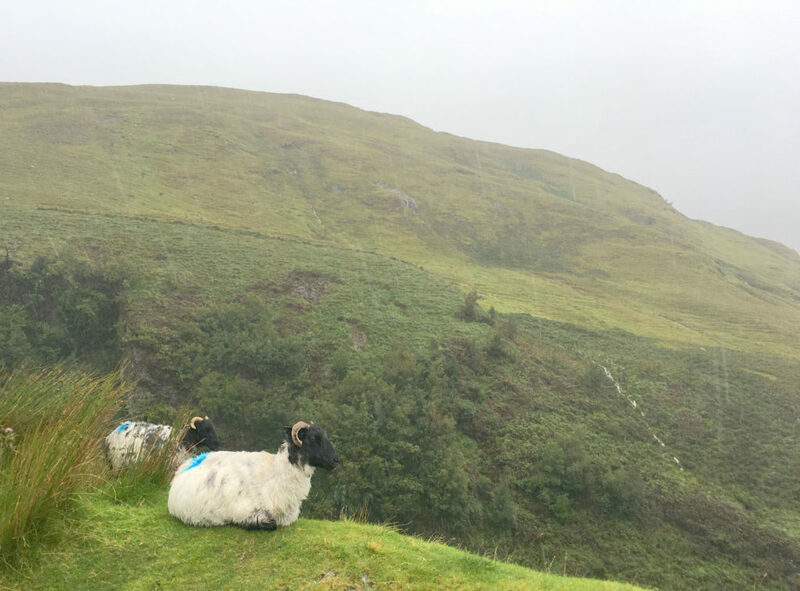 Of course you can buy your Irish wool upon arrival and dress like sheep for the baaah’d weather. Ireland’s west coast is the worst, in the mountains. However, Ireland’s outlying islands have better weather, counterintuitive, but true that its often sunny on the Aran Islands, Clare and Inishturk, and raining in the Connemara mountains and Galway. 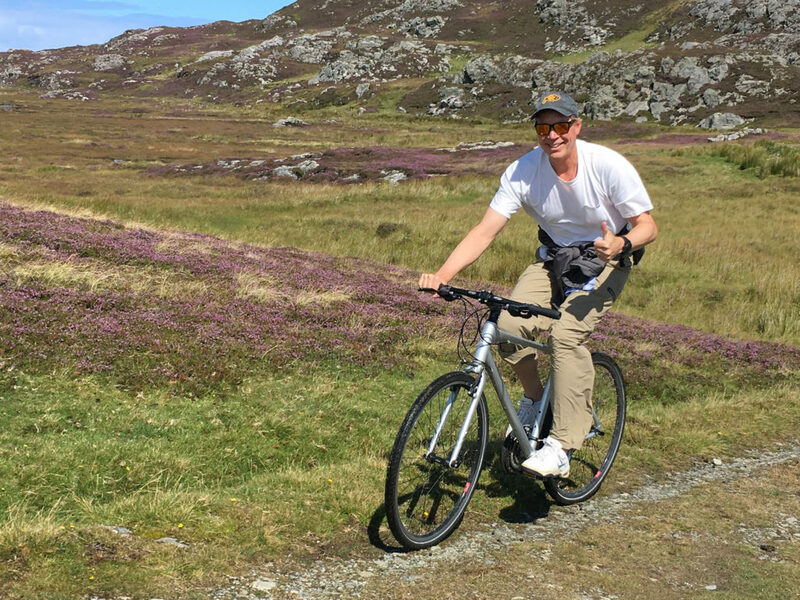 Driving in Ireland is a wee bit crazy, you drive on the left, but the driver’s seat is on the right, often a manual stick on your left. 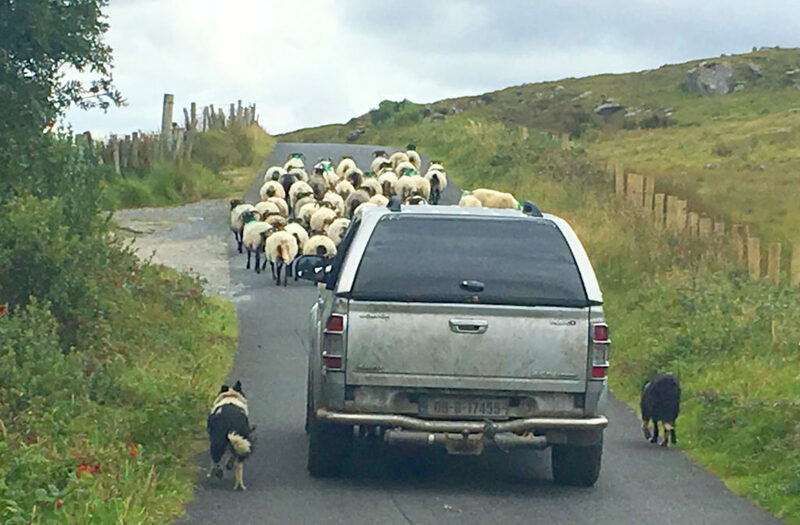 If that’s not enough, the roads are ridiculously narrow in places, be prepared to stop for sheep crossing, or another car since you both can’t pass in some precarious places. 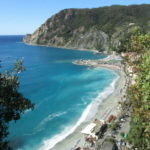 If you rent a car, be sure you have an international waiver and coverage with your Credit Card company, and bring a copy as proof. Inspect your car carefully, and don’t be shocked by the dings on the sides… this too could happen to you. 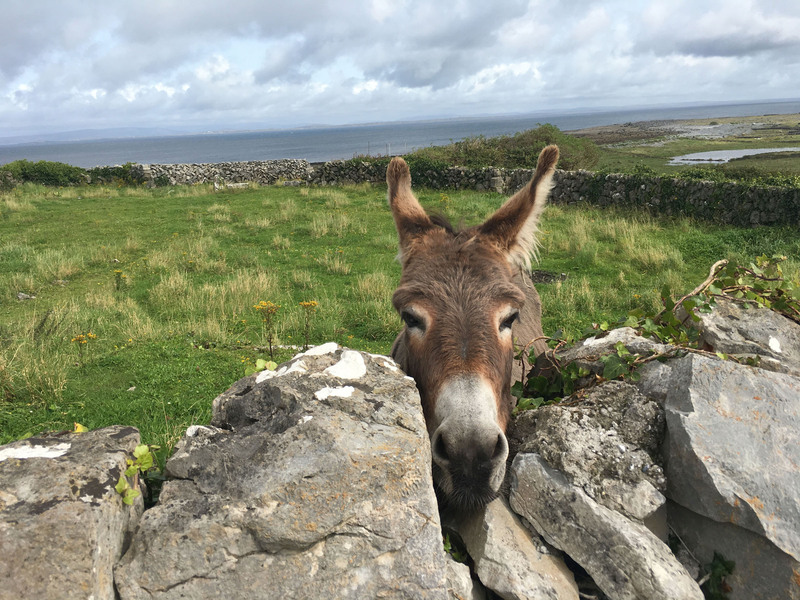 Irish Tourism offices are mediocre in their helpfulness. Loaded with brochures, but no maps…. which they “used to sell a lot of”. 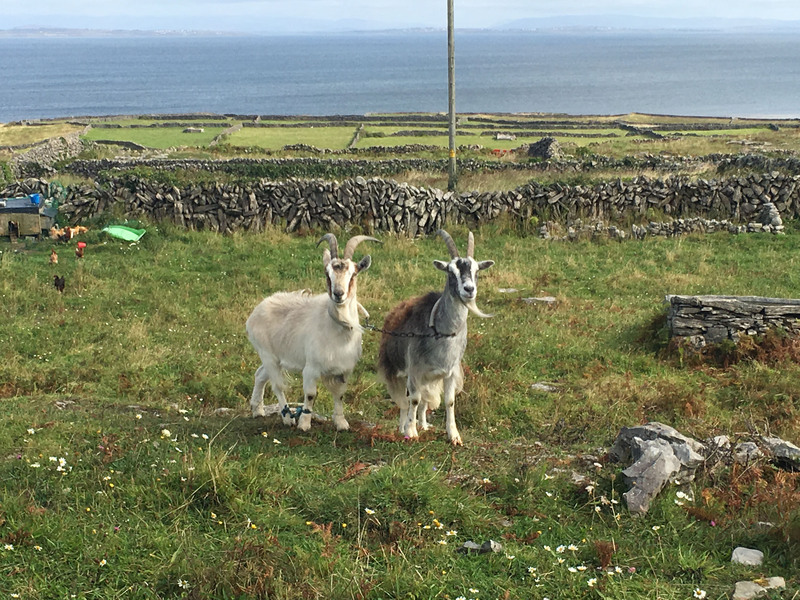 They don’t offer WiFi either, so you can’t download their Wild Atlantic Way app which they admit uses a ton of space and data. 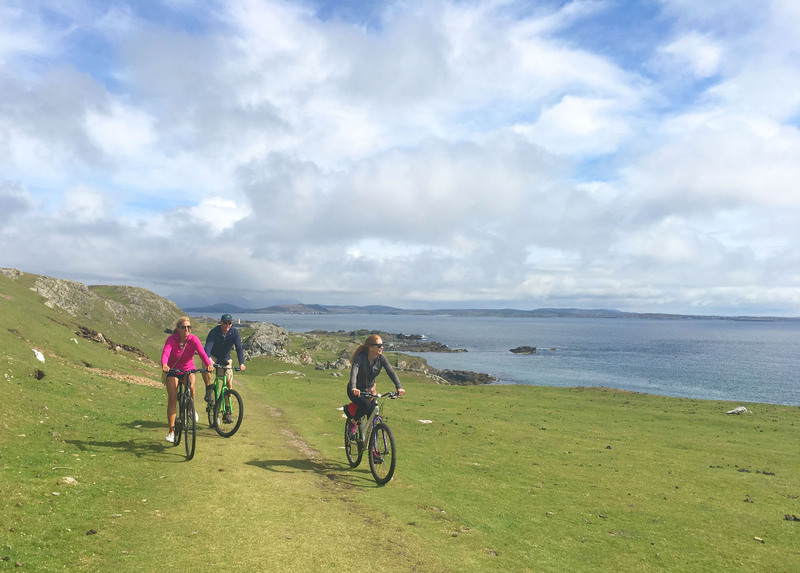 Biking in Ireland is beautiful with views to die for…quite literally. 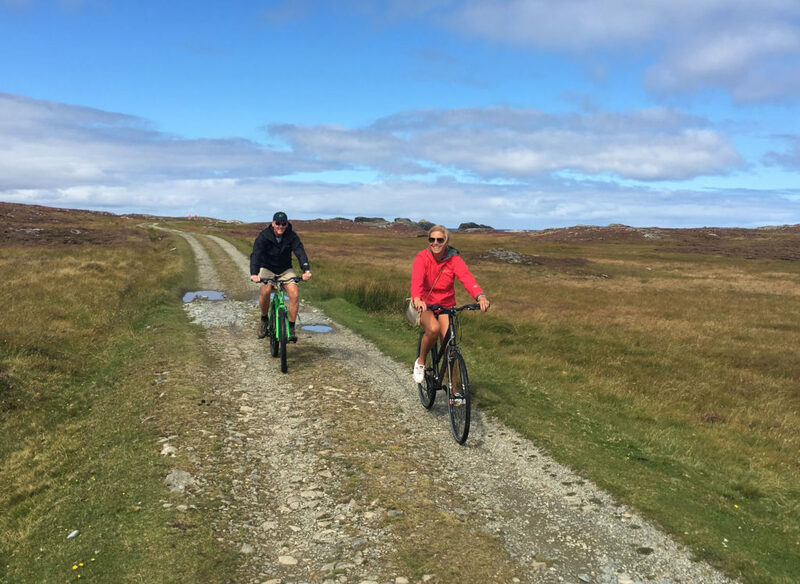 Bring you’re A-Game to bike Ireland (and wear bright-colored, water-resistant bike clothes), there aren’t many dedicated bike paths so you are on winding hilly roads, with occasional tour buses whizzing by (that’s why we prefer biking the less-trafficked quieter Irish islands). Bugs in Ireland – Midges are a real problem, especially in the bog country of Connemara. These nasty little mosquito-like biting insects can leave you with bumps and hives. 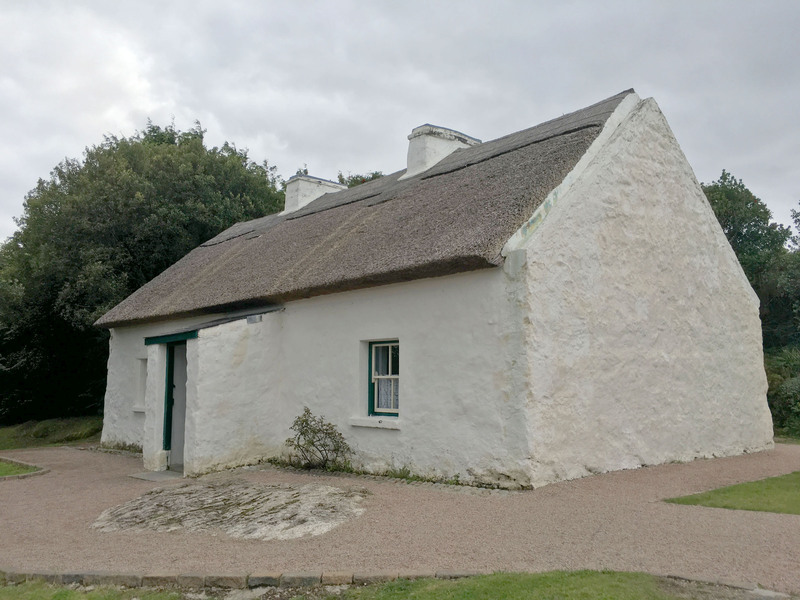 To exacerbate the midge menace, many Irish homes and don’t have screens.